Dar Al Masyaf, Dubai is a luxury palace, immersed in Arabian culture. Terracotta and vibrant colours, arches and intricate carpentry all lend themselves to Dar Al Masyaf, creating a truly unique and timeless resort. Beautifully manicured gardens and lush palm trees grace this resort and views are breathtaking. Imperial Arabian summer houses bleed majestic beauty and opulence; each with regal intricacies and private swimming pools. Accessing the lavish summer houses by waterways, using abras (gondolas) only heightens the exclusivity of Dar Al Masyaf and guests soon realise they are in an Emirati paradise. Enjoy being pampered at Talise Spa, who offers signature treatments with techniques from around the world to re-energise mind, body and soul. One of the finest hotels in Dubai is sure to have culinary dining experiences that are tantalising, delightful and heart warming. Lazing on an abra, relaxing on a sun lounger on the golden beach or nestled in the sanctuary of your summer house, each moment at Dar Al Masyaf will be utterly spell binding and guests will be spoilt with pure Arabian luxury. Immerse yourself in ultimate relaxation which focuses on its guests’ every need. Therapy treatments to relax, energise and rejuvenate are mastered and crafted. Alluring tranquillity is laid bare and guests are in a relaxing sanctuary that is for mind, body and soul. Sinbad’s’ Kids Club – Keeping younger guests entertained at Dar Al Masyaf is made easy by Sinbad’s Kids Club. Energetic activities are scheduled daily, to keep them engaged and having fun. Art and crafts, movie nights, rock climbing and discos are just a few. Wild Wadi Waterpark – Being one of the most fantastic water parks in the world, Wild Wadi Waterpark is designed for both the faint hearted and thrill seekers. Spend the day in the lazy rivers or riding the rapid rivers, guests will never forget their time at Wild Wadi Waterpark. 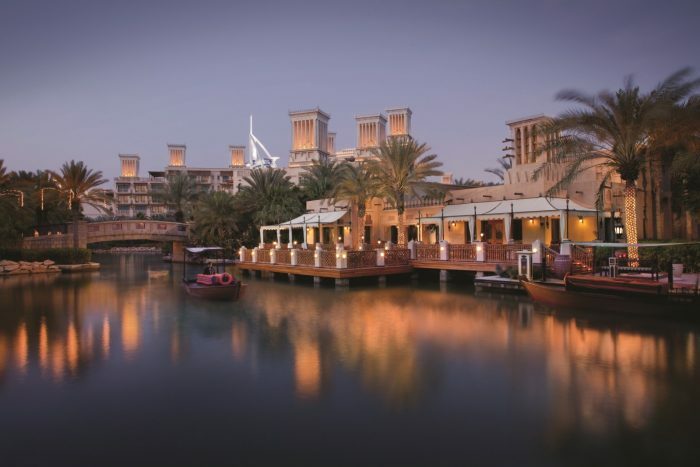 Souk Madinat – A souk which is full of Arabian culture and tradition. Every stride taken will fill your imagination with the Arabian way of life. A great place to explore, there are many restaurants and bars to be enjoyed too; relax with an Arabian cup of tea and dates. Evening strolls on Jumeirah Beach are fantastic picturesque moments. Listen to the waves gently crash against the soft gold sands that mould to your feet. Dar Al Masyaf Dubai is a hypnotising resort which charms from the moment honeymooners arrive. Serving Arabian treats such as dates and tea on arrival adds to the experience and guests are surrounded by regal architecture that is meticulous and perfumed scents of Arabia that are beautiful. Brimming with exquisite Arabic traditions; each waterway, each walkway and each terrace magnifies the mesmerising experience. Airy, luxury summer houses are private hideaways, secluded from the world and allowing guests to drift away in the Arabian sun, into a world of their own by a tropical private pool. Abras (gondolas) create intimate private moments, meandering through the inspiring resort by waterways and guests sense the lavishness and sophistication; such eye catching beauty is limitless at Dar Al Masyaf. Fine dining experiences are luscious and make for wonderful pass times. Effortless, casual dining at the private pools or by a beach club is tasty and well needed. Talise Spa and Fitness Centre are relaxing havens away from the summer houses. Wellbeing experiences will awaken your soul; rejoice with a couple’s treatment that is impeccably masterful and reinvigorating. Centimento – A rooftop bar that had endless views of Madinat Jumeirah is a mesmerising way to spend the evening. Sit back and be charmed as the sun sets beyond and the gentle Arabian breeze sways the palm trees. Tantalising choices are many, but below we have listed just a few to feed your imagination. Pai Thai – Thai cuisine that is as full in flavour as it is in colour. Luscious curries and sauces are served with unique sides. Segreto – Famous for pastas and pizzas, appetising Italian food is served up at this elegant restaurant. Zheng He’s – delightful Cantonese cuisine is served with a contemporary edge. Arboretum – International and regional specialities are full in flavour and captivating in taste. Shimmers – A beach side barbeque where the meat is char grilled and dishes are served with a fiery sizzle and fresh salads. The Noodle House – Perfect noodles are served with a host of tasty sauces, chopsticks are at the ready.